In less than perfect first half weather, the year of the football Tiger continued as the black and gold distanced the UNB Saint John Seawolves, 35-0. During a drizzly first quarter, the Dalhousie receivers had a few drops but the run game came to the forefront! Ever consistent, running back Zack Leger provided the fire power scoring 3 touchdowns on 13 carries for 153 yards. Leger’s versatility was again witnessed as he made defenders miss, ran a few over or would bounce off and sprint away on majors from 42, 28 and 10 yards out. Top D performers in this weekend tilt were: Jack Chaisson with 6 tackles and one sack, Liam Manson 3 tackles, 1 sack and 1 fumble recovery and Josh Bordage with 5 tackles and 1 fumble recovery. A pleasant surprise was seeing DT David Parkhill back in action contributing 2 sacks and 2 tackles. Needless to say chairman, Jim Wilson is ecstatic to be going to the AFL for the second straight year. He commented, “Coach Haggett has done a wonderful job of keeping our players focused and we can’t wait for the championship game against Holland College next week. The Tigers defeated the Hurricanes in their home and away tilts this year. But as they say, “any given Sunday”. Such was the case on Saturday as third seeded Holland College edged the second place UNBF Red Bombers, 15-10. All Dalhousie students, Alumni, and outside fans are invited to show their spirit and colours in what should be an entertaining and exciting gridiron encounter on Wickwire Field, Saturday, November 5th at 1 pm. Stewart McKelvey is our Championship Game sponsor and we expect a big crowd. 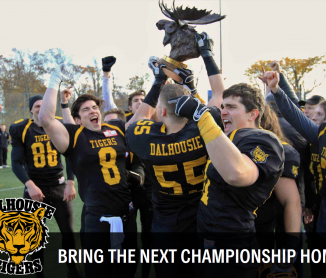 Tickets will be on sale all week at the Dalhousie Bookstore, at Dalplex and at the gate on game day. The after party will be at the Grawood.